Democrat Senator Mark Udall is considered to be vulnerable in 2014, but the general consensus was that Ken Buck was going to have an uphill battle to defeat him. Happily, a much stronger candidate, Cory Gardner, decided to get in the Senate race while Buck decided to run for Gardner’s House seat. So, instead of a brutal primary, we have a great chance to get Buck in the House and Cory Gardner into the Senate. That’s a win/win, especially in a state that Barack Obama won by 5 points in 2012. 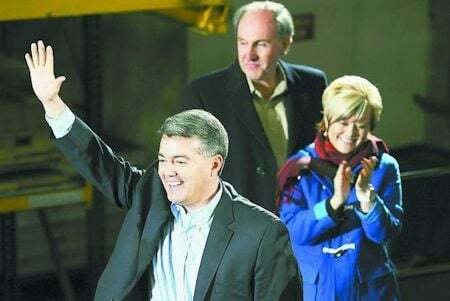 Poll numbers that were released just this week look exceptionally good for this point in the election cycle..
Republican Cory Gardner is inching closer to incumbent Democrat Mark Udall in the U.S. Senate race from Colorado, according to a new poll. In numbers released by Public Policy Polling, Gardner, who serves in the U.S. House, trails by 2 percentage points – 42 to 40. The data reflects Udall’s job performance numbers: 41 percent of Colorado voters polled approve and 40 disapprove. For an incumbent, being below 50% at this point in the game is a sign of weakness. Sitting at 42%, only 2% ahead of your opponent, puts you in the danger zone. Cory Gardner is conservative, against amnesty, and it would be a very big deal for him to replace a liberal like Udall. That’s why Right Wing News endorses Cory Gardner for Senate.